How are you today, dear fellow saints? How is your life going? Is it going like you were hoping? Can you look back and say, – wow, this is what I was dreaming about. Everything has happened exactly as I was expecting. I would dare to assume that for most of us it is not true. Life in this broken world usually is far from perfect. We have our dreams and hopes, but as our lives go on, there is less, and less time left for them to come true. There are things we long for, and then there is the reality that we need to deal with. It is true with our relationships, work life, health, and so on. We face it daily. How do we feel when the reality doesn’t match our expectations? Perhaps disappointed, irritated. Perhaps disheartened. Maybe even in despair. Do we feel grateful? Do we feel like praising God? We may feel like praising God when good things happen, good according to our understanding. Then we may remember that it would be nice to thank our Father who is in Heaven. Have you thought about how this praising God works? When things go our way and we feel great, we may remember to praise Him. And when we don’t feel that great, we usually don’t. Then we are focused on our challenges. But what if we changed this pattern? Should we at least consider it? Today we all together said Psalm 145. It is one of the psalms of praise. It is one of the psalms of David. The famous king of Israel. What was His life like? Were there reasons for praise? At the first sight it may appear that he really had it all. Chosen by God, victorious military leader, loved by his fellow-solders, king of Israel, husband of many wives … and father of many children, author of many psalms, and even the line of the coming Savior was named after him. We know Jesus as the Son of David. What else one may dream about? It seems so at first. But is that the whole story? Victorious, yes, but hated and persecuted for many years by his own king. Spending years in exile, fleeing and hiding to save his life. Even when reigning, being haunted by political intrigues, plots and riots. Rejected and betrayed by his closest family members. That hurts… Experiencing one family tragedy after another till the last days of his life. Does that sound like a perfect life? Many of David’s psalms contain cries for help as he reaches to the Lord, searching for shelter, for protection, for escape. But so many of his psalms contain praise and thanks to the Lord, even as David is hit by trouble. And the psalm that we heard today, is pure praise and gratitude. What can we learn from David? Should we reconsider when we praise our Lord? Should we praise Him much more, and especially when we are battling our battles? Should instead of focusing on the struggles of this life we better lift our hearts up to our glorious Lord? How would it be, if instead of being consumed by the harsh reality of this age, we would rather gaze and marvel at the splendid glory and goodness of our loving Father and our faithful Master Jesus? It is worth trying. How should we do it? I guess you all have had those moments in your life when you faced such beauty, that moved your heart and all senses, when your whole being was ready to sing out of joy. Some of our Barossa sunsets would be good candidates. When that happened, what did you want to do? With our whole being we want to… share them. We need to express what we experience. That’s when we can learn why God has given us mouth and speech. To share, to speak His praise! Now, there are many beautiful and breathtaking things, places and people in this world. But there is someone, whose greatness and power, whose love and faithfulness, whose grace and mercy are not only praiseworthy. They are life changing. Everyone who has encountered Him, everyone who has experienced His presence is changed. When He comes close to us, we feel embraced by the divine. He turns our sadness into joy, our despair into hope, our shame into praise. You know who I am talking about. The Father, the Son and the Holy Spirit. The Triune God, the Holy One. Your Creator and Redeemer. How should we praise Him? We can learn a lot from Ps 145. Let’s just take a brief look at how David models for us how to be grateful and how to praise the Lord. “All your works shall give thanks to you, O LORD, and all your saints shall bless you!” When we have in our English text the word “Lord” with capital letters, do you know what is written in the original text? God’s name, Yahweh. This is what we are to do, to speak of the glory of God’s Kingdom, and to make known to all the children of man God’s mighty deeds. This is a joyful privilege, even if sometimes we may see it as a burdensome task. We know this God, He has come to us, He has revealed Himself to us. But many still don’t Him, so many still are hostile towards Him. And when we marvel at God’s power and goodness, it just happens naturally, we can’t stop ourselves, we want to share this most beautiful experience. Come and taste that the Lord is good! “Your kingdom is an everlasting kingdom, and your dominion endures throughout all generations.” His reign, His power, His control, they don’t have limits. This world, this age will pass away, but the Kingdom of God will remain forever. And not only that. Also those who are made heirs of God’s Kingdom through Jesus, meaning you, will remain forever. “The LORD is faithful in all his words and kind in all his works.” How sweet are these words! They are the foundation of our Christian hope. The Lord’s words, His promises. You have received many of them. Many of them haven’t been fulfilled yet in our lives. Eternal life. Eternal home in New Heavens and New Earth. Everlasting joy and blessedness living and rejoicing in God’s presence and seeing Him as He is. There are still to come. But we know that the Lord is faithful in all His words and kind in all His works. He will give to you, what He has promised. This heaven and earth will pass away, but His word, His promises endure forever. “The LORD upholds all who are falling and raises up all who are bowed down.” From time to time we face situations where we fall, or where our entire life may be falling apart, and there is no one in this world who can fix it. Where else can we go, but to you, or Lord! And who else is always waiting for us with outstretched arms, just as the gracious father in the parable of the Prodigal Son, ready to run and embrace us. Especially, if we come to Him humble, bowed down. This is the most fitting posture to approach our God. Before Him we all are like beggars, He doesn’t owe us anything, we can’t demand from Him anything. But in His grace, He richly provides for us everything that we need for this life and the life to come. And these words will be familiar to many of you. “The eyes of all look to you, and you give them their food in due season. You open your hand; you satisfy the desire of every living thing.” Where have you heard them? This language reminds us how close our God is to us. How caring our Creator is to everyone in this world. As loving father opens His hand to provide for his children, so our Creator in His goodness opens His generous hand to satisfy the needs of all people. David goes on: “the LORD is righteous in all his ways and kind in all his works.” Is that so? Many may disagree with this statement. Is this God indeed righteous and kind in all His ways and all His works? If you look at the world around us, or even at your own life, not everything looks right and well. If this God is in charge, how can we say that He is righteous and kind? There are two ways we may think about God. We may try to understand Him by looking at what happens in the world, or we may try to understand Him looking at His revelation. Where has our God revealed Himself? That’s right, in Jesus Christ. In what He did for us. This is how Christians know the Triune God. We know Him as our loving Father, and our brother, who sacrificed His life for us. We know Him as always present with us, and especially during our greatest struggles. Christians don’t need to speculate why He has done this or that. We know Him, His loving hearth, and when He finally brings forth the New Heavens and New Earth, we will see that everything that He has done, was just and kind. “The LORD is near to all who call on him, to all who call on him in truth.” Again, this is one of trademarks of the Triune God. He is not absent. He is not distant. He is not just something higher. He is close to all who call on Him. All who “call on His name” in the Bible means – all who worship Him. This is where our God comes the closest, where He hears our prayers, where He blesses us with His Spirit, where He restores and heals us, lifts us up and makes us good, this is where He is near to us. “He fulfills the desire of those who fear him; he also hears their cry and saves them. The LORD preserves all who love him, but all the wicked he will destroy.” And again, this should sound familiar. Only two groups of people. Those who fear and love Him and … keep His Commandments. And those who hate Him. Why should we fear God? So that we do not sin and therefore do not make our God angry or disappoint Him. Why should we love Him? For everything that He has done and does for us. Every day and every minute. But the wicked, those who hate Him, make no mistake, they will be destroyed. 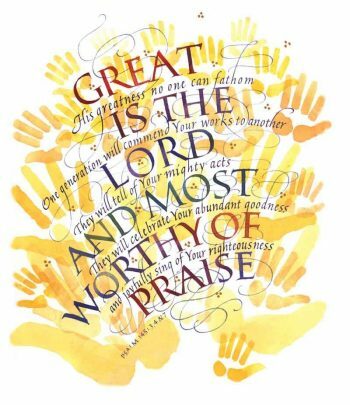 The king David concludes this psalm of praise the same way he begins it: “My mouth will speak the praise of the LORD, and let all flesh bless his holy name forever and ever.” And we all are invited to join in. Speaking the praise of the Lord with our mouth. We should do more of it. Especially when we go through hardship, especially when we seem to be overwhelmed with our daily struggles. For when our eyes are fixed on Jesus, we can see and experience that His eyes are fixed on us. And when we see that, our mouth will declare His praise! Praise be to the Lord! Amen.